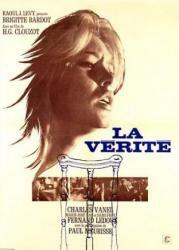 Drama/Crime, France/Italy, 1960, 127 min. Tagline Suppose I'm a tramp... why can't I be in love? Synopsis Dominique Marceau is on trial for the murder of Gilbert Tellier. The counsels duel relentlessly, elaborating explanations for why the pretty, idle and fickle girl killed the talented and ambitious conductor freshly graduated from the conservatory. Was it passion, vengeance, desperation, an accident? The acquaintances of Gilbert testify, as well as Dominique's former lovers, and her sister, Annie, the studious violin player engaged to Gilbert. The evidence they give progressively paints a more finely-shaded picture of the personalities of Dominique and Gilbert, and of their relationship, than the eloquent and convincing justifications of the counsels.